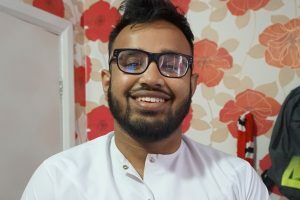 About the Author: My name is Abed Ahmed and I’m a 24 year old secondary school maths teacher who stammers! Since becoming a maths teacher, I ran my own sessions to improve the confidence of the pupils who stammer and tried to help them reach a greater degree of fluency in their speech (this was not the end goal). I was able to assist in their development by conducting a variety of sessions; drama and theatrical role play, interview practice and tips, advice on how to approach people and overall, acted as a general supporting figure to give students the belief that they can speak their mind, thus in line with the “speak your mind” theme. Here is a video of their journey. The submission from last year may help to give some further information and context. Thank you for sharing your experiences as a person who stutters with your students and the community. It was very inspirational to see your students share their rules of how to speak to an individual who stutters with an audience of supportive listeners. After reading about your sessions with students, I was wondering how you structure the drama and theatrical role play sessions? Do your students practice singing, act out social situations, or something of the like? Thank you again for sharing! That is awesome! It sounds like you are really giving your students the opportunity to generalize their skills to social scenarios that may happen in real-life. Thank you again for sharing! So happy you’re paying it forward and give these students the tools and pride to stand tall! Many thanks and happy ISAD. Keep talking! Your work with these children is very inspiring! What is the first thing you tell a child who tells you they are embarrassed by their stammer? I love how you focus on building confidence and allow them to apply and practice those skills in speaking situations! Good to meet you at the BSA brother and keep up the good work. The League of Extraordinary Stuttering Educators rules! Love the last bit of your comment Grant! Was living meeting you too! Hi Abed – I really enjoyed watching this video and seeing the positive impact you are having on these students’ lives. I am currently a graduate student in a Speech-Language Pathology program and I am taking a course on fluency right now. In class, we discuss a lot about the importance of building confidence in our students who stutter. You said you provide advice to your students on how to approach other people, and my question for you is what kind of advice do you give them on this matter? I would love to hear what you have found to be useful for yourself and your students so that I can implement those ideas in therapy sessions for any of my future clients who stutter. Hi Kayla. That’s amazing what you’re doing! What country is this by way? (I love knowing where people are from when commenting on this website). I always tells my pupils that approaching people is down to confidence. Even some people who don’t stammer find it difficult to approach people. So what we do is we do some role play within the group. For example, I’ll get them to work in pairs and get them to try what works best for them. Then they’ll swap around with others in the group and have a go. I then give them some odd few tips here and there. Simple things like smiling and talking, taking as much time as you want, breathing regularly but ultimately making sure that you say what you want to say. No avoidance, nothing. I always reassure them that majority of the people in this world are nice and will always be helpful. The more practise you do the better. Hi Abed- like the others who commented previously this video was very inspiring for me. I like how you encourage your students to be open with their classmates about their stammering. I was wondering if you could comment on the importance of community for those who stutter. What would you tell a child who did not know anyone else who stammered and was having a hard time feeling confident? What were the differences you saw in your own students after they had experienced community with other children? Thanks! Hi Taylor, thanks so much for your kind words. Means a lot! The importance of community is absolutely crucial. I didn’t know a person who stammers until I was 21. Incredibly late in my life. I felt isolated and fell as if it was only me. I realised that as soon as all my PWS were in the same room with others, it felt like it was a safe haven for them to be whoever they wanted to be. It was powerful. They were different people. They were HAPPY. Once they got used to this, it was evident that they became confident. They were talking and stammering loads with others without being fearful. They were educating other kids in assembly too. Their confidence grew. Community is key! I really enjoyed watching your video. I thought it did a great job capturing your own experience and how you are using it to help others who stutter. The one line that really stood out to me was “stammer with confidence.” I think this mindset is really important for people who stutter and anyone in general to do live their lives with confidence. I also think that being a teacher allows you a great opportunity to spread awareness that people who stutter do not have to shy away from professions that require a lot of speaking. One of the more common challenges I have learned about in my studies has been connecting people who stutter with one another in order to build a support system. I am really glad to see that your students in the video have a place where they feel they can speak freely without judgement and had the opportunity to speak in front of their class. I know your profile said you are a secondary teacher, but do you work with younger students? Similarly, are you involved in any community programs? Thank you for sharing your story! Abed, this video is incredible! I truly loved watching and reading. I am currently a SLP grad student, and in the future, I will work with individuals who stutter. Our professor emphasizes the importance of helping these children develop confidence and self-worth. I’m wondering what your experience was in developing these ideals. Did you work with an individual who sparked this in you? If so, how might I share in helping to implement these ideals with my students in the future? Or, what advice might you have for myself when forming connections with my students to best help them develop confidence? Hi Abed! I am a speech-language pathology graduate student.I love the fact that your video instills confidence in your students and understanding from their peers. My questions to you are, what was the outcome you observed from this assembly? What changes have you seen in your students, as well as their peers? Have other teachers reported changes in the students’ behavior towards stammering since? Have you had requests to put on another assembly like this at other schools or facilities? What a beautiful film! I commend you for your work. I can imagine the impact you are having on your students because of your willingness to share your own experience. I loved hearing from those students and seeing their willingness to speak out. Many of the PWS who I have met didn’t know another person who stuttered in their childhoods. I am sure that by connecting these students with each other and sharing your positive contribution they can take that support with them into the future. Thank you for investing in your students, we will all benefit from your voices! My name is Jamie and I am a 2nd year graduate student (speech pathology) at the University of MN-Duluth. I loved your video. I loved how you hold confidence/gaining confidence to a really high standard. My question for you is: how have you took on the role of being an advocate for yourself and others who stutter? What a wonderful and impactful video! I am a graduate student studying speech language pathologist and am currently in a fluency class. I love that you are building up confidence in your students and through that confidence educating other students in the school about stammering. What are some of the first steps that you take to help your student’s who stammer to feel confident about their stammer? Also, what impact or change have you seen from your students and their classmates after they spoke about stammering? Hello Abed, thanks for all that you do to help others. I loved the idea of doing role plays and giving tips for approaching people. I bet that is something that all students (whether they stutter or not) could use help with, especially now that talking face to face is often replaced with texting or emails. One question I have is if you use pseudostuttering to help your students increase confidence and control? If so, do you find it helpful? Thank you for making this video, Abed! I appreciate how you have become a role model for the students. You give them the support to gain confidence in saying what they want to say. Public speaking can be intimidating but you provided them with strategies if they became nervous during their presentation. I wish and hope that students who stutter get the opportunity to advocate for themselves like your students did. On a side note, you mentioned you use drama and theatrical role-play in your sessions with the students. What does this look like and does assist them in their communication and confidence? All my sessions are based on me passing on words of wisdom and advice how to tackle everyday situation. I think one of the best ways to become happy and a stammerer is by accepting it and then talking about it. I taught my pupils who stammer that they should talk about this freely to all and to educate everyone about it. Only that way will the world become a better place. In terms of drama and role play. It is incredibly enjoyable! I simply get them to make their own plays and perform it to me! When it comes to role play, we act out daily scenarios and situations we find ourselves in where we struggle to speak. Your video was wonderful. As I have read and watched other stories there have been several remarks of feeling isolated and alone. I love the role model you are for these children who stammer, and for those who don’t. It is invaluable for them to see that there is someone like them who has accomplished what he wanted to. I loved that you had your group get up and tell the other children about stammering. I appreciated that you told the audience that they needed to to be supportive. Children do need to know how to behave around others. It also gives them an understanding that it’s nothing to be afraid of. Thank you for sharing your story and helping others, especially me, learn more! I wish you luck in your future and hope that you will have the opportunity to continue to teach many people. Hi Heather. Thanks so much for your kind words, means a lot to me and my students. Best thing is, it was the pupils’ idea to do this, they wanted to educate everyone else. This wasn’t done overnight, we’ve all worked hard together to become confident in stammering. I believe they’ve all accepted their stammer and are now making strides in school. I hope that more PWS can feel motivated too because they can all do it!! Such a beautiful story. Thank you for caring so much about your students, it is truly inspiring! Your compassion and positive attitude are contagious and it does not go unnoticed. I think what you are doing for your students will be very beneficial for them and it is very functional. After watching your story I am curious, how did your students feel after they shared on stage about their stutter? Did they feel that helped them gain more confidence? My name is Laura and I’m a graduate student at the University of Minnesota Duluth studying speech language pathology. I really enjoyed the video you created. Those students are so lucky to have you in their life! As others have commented you have given them confidence and created a support group for them to be a part of. I currently provide services to a preschool student who stutters and his teacher asked my supervisor and I for advice. As a teacher yourself, what advice would you give this preschool teacher? Preschool I’m guessing kids under 5? I wish I knew what to say, but unfortunately I’m not a speech language therapist but I can try. I tell all teachers to teacher all PWS the same. Don’t treat them differently. Let them finish their sentences. Smile when talking to them. Give them all the world to finish talking. My name is Conrad, I am currently taking an advanced fluency disorders course at the University of MN-Duluth. I am so glad that I came across your video, thanks for sharing! Currently, I am 23-years old, and I have to say that it is very encouraging to see the impact that you are making at only 24 years of age. You are having such a long-lasting impact on these students. I was able to relate to the point where you said that we must accept the challenges we face in life in order to move forward. I may not be someone who stammers, but your advice is so relevant for other challenges that I am currently facing. When we can accept these trials and challenges, we can begin to move forward and even help others who are going through the same things. As a future speech-language pathologist, I was wondering if there was a specific time in your life where you found this acceptance of your stammer? In other words, when was that movement when you were able to move forward and be confident in your stammer? Again, thank you for your video and for your time! Thanks so much for your kind words. Everyone has their own battles that they face daily. Let’s face them head on and tackle it. The sooner we accept things, the better life becomes. Thank you for sharing your experiences as a person who stutters with your students and the community. How do you feel you have seen your students develop over time within your support group? Additionally, how did you get your students to start attending group? We have a group at the school I attend but find it challenging to get students to feel comfortable enough to attend. My pupils have honestly become different people to what they were at the beginning. They’ve all come very far and have been incredibly confident around the school. In fact, their teachers have been telling me that they talk too much now! They’ve come really far. Getting students to attend is hard. What I personally did was meet them all one to one (before our group began) and speak to them about what I can offer. I used to emphathise with them and reassure them that this session will strictly be about confidence building. Slowly they all started to attend regularly and they used to enjoy the sessions. It needs to be fun for young people. End of the day, they’re still kids and will get bored easily. I play a lot of games that require talking and try make things interactive. Then once you got them board, maybe slowly start to incorporate speech and language stuff maybe? My name is Taylor and I am currently a 1st year graduate student studying speech language pathology. Thank you so much for sharing your story and your student’s experiences. You put together a great video that showcased an awesome program. I think that as future clinicians, we can learn a lot from your experiences to best help our clients. Thank you Taylor for your kind words. It really does mean a lot! I was so happy to see that these children have such a positive role model! Many children do not get to meet other children or adults who stutter/stammer, and this can be so isolating. It’s so important for them to be able to have someone like you that is successful and confident, so they can be confident as well. I am a speech pathology grad student and this gives me hope to support my future clients to be confident and comfortable with their speech. Thank you so much for being so open and supportive with your students, and thanks for the awesome video! I am a second-year graduate student at the University of Minnesota-Duluth and am taking an advanced fluency class. I am good friends with Conrad, who previously wrote to you! 🙂 We had an interesting panel come to one of our advanced fluency classes to discuss various aspects about stuttering and answer our questions in person. I remember one comment from a woman vividly: One individual said if there was a “easy” button that she could hit to fix her stammer/stutter, she would absolutely hit it. I am curious, from reading your comments about accepting your stammer and not letting it hold you back, would you every hit an “easy” button to make your stammer/stutter disappear? What are your thoughts on this person’s comment? Can you relate to it? Thank you for your work and being such a positive influence for your students! Keep up the amazing work! Thank you so much for sharing this inspirational journey! I loved this and thought it was incredibly valuable! Education and community support is so important. Having your students share their journey and encouraging them to be comfortable in their skin in front of a supportive audience is such a wonderful idea. I think we need more groups like this in order to support individuals who stutter as well as provide education to listeners and the community. My name is Leigha Maurer, and I am a undergraduate speech-language pathology major. I am very impressed with your story! My goal is to eventually work in the schools so I found this very interesting. I noticed that it appeared that you had the group members acting, singing, etc. I was wondering how you incorporated this with the lessons you also teach. I think this is a great tool to help the kids grow confidence! I just was not exactly sure whether or not you added “lessons” within the skits or if they are merely confidence boosting exercises. Thank you so much for sharing your students and your personal experience and thank you for your dedication to helping these young children. What advice would you give me as an undergraduate Speech Pathology student that hopes to one day open a pediatric speech clinic? I am an undergraduate speech student and I am taking a communication disorders class. What you are doing for the students is amazing and i feel it is going to shape them to accept and love themselves and others in an extraordinary way. If you don’t mind me asking when was the defining factor where you decided to take a stand and help the students who also have a stammer? what do you believe is a major piece(s) of advice could i give a child who has a stammer as a speech therapist?